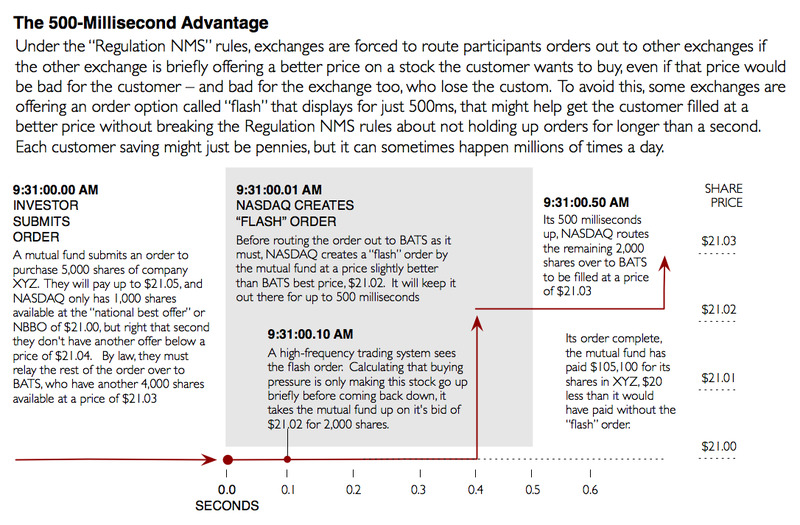 Quantitative Trading: Are flash orders really so bad? The reason flash orders are bad is that they allow some market participants to look at the order book and then decide if they will fill the order or not. So when a lot of large orders start arriving, they can join them and trade in front of them (while the orders are still being flashed), but when small orders arrive, they can fill them. They can jump in front of limit orders when non market-moving orders arrive and then leave only the market-moving orders to fill the limit orders. It is kind of like getting to put a limit order out there, but then being able to cancel it after you see how it would have filled. The problem with flash orders is that it allows some market participants to provide liquidity when there is little risk in doing so without requiring them to stay there when the risk of providing liquidity increases. So they get to collect all the income from providing liquidity without taking on the risks. In other words, it allows them to provide liquidity when it is profitable and not very necessary without requiring them to stay there when the market is one-sided and the liquidity is actually needed. There is no way that a true market maker can compete with that business model. Thank you for your good explanation. However, I don't necessarily agree with the "trade in front of them" part, since by the time the HF traders see the flash orders, they can only snap up the liquidity in other markets where there are better prices. And if there are really better prices in other markets, why didn't the first trader route the order to those markets in the first place? I agree with the part about not providing liquidity when they see the flash order is large. But like Joe Ratterman said, this is only a problem because SEC regulation does not allow locked market when the bid price for a large buy order can be higher than the best ask price of a small order size. If such locked market is allowed, then there won't be any need for flash orders, and everybody can see the complete order on a certain market and see whether they want to fill it. In that sense, yes, I agree that given the current regulations, flash orders are unfair. But the way to fix the problem is not just to abolish them ... it is to change the regulation concerning locked markets. Thanks for your link to the blog.themistrading.com. However, there are some details in that blog that I don't necessarily agree with. "1-The market on XYZ is 21.05 bid for 500 shares, 500 shares offered at 21.08. 2- Say you want to buy 500 shares of XYZ at 21.08. You place a buy order with a $21.08 limit through your online broker . 3- Your broker routes to a market center which utilizes the flash method. Before your order gets routed to the market center which has the $21.08 offer, it is flashed to a subset of market participants. 4- A flash subscriber see this buy order coming and decides to trade in front of it and buy the 500 shares at $21.08 for their own account. 5-You get nothing done and 500 shares trades at $21.08." But wait! Why should your online broker route your order to the market center that does NOT have the $21.08 offer? Why not directly route it to the one that HAS that offer and you can be filled immediately without all that flashing? It seems to me it is the fault of your broker that you got "front-run", not the fault of the market center with the flash orders. Didn't you know that Wallstreet is bad and you trying to defend it was bad? A question I have is what about the pits? Remember those? The pits where people give hints, winks, nods to each in a quest to sell and buy things? I wonder if a pit is not the ultimate frontrunning? Could not the argument be made that when big orders from clueless people come to the pit the pit just gives them the worst price? 1. Let us say a mutual fund submits a buy order for 10,000 shares of XYZ at 10.00 at BATS. 2. BATS has a offer for 4,000 shares at 10.00 but now other "best" offer. However, BATS sees that NASDAQ has an offer for 6000 shares @ 10.02. So, in accordance with NMS rules, BATS should route the remaining 6,000 shares to NASDAQ for execution. 3. However, BATS supports "flash" orders. So, before routing the remaining 6000 shares to NASDAQ, BATS creates a "flash" order for 6000 shares @ 10.01 (a better price than NASDAQ's 10.02). 4. Now, if a "flash" subscriber firm sees the order and accepts the order, then the mutual fund benefits, and also BATS collects its commission. 5. However, the problem occurs when a HF/IB sees this order, and then sees that NASDAQ has offers for 6000 @ 10.02 and another 3000 @ 10.04, and decides to front run the mutual fund's order by buying NASDAQ's 6000 @ 10.02 and posting an offer for 6000 @ 10.03 fully knowing that within the next 500 ms the mutual fund's order will be hitting NASDAQ's new offer at 10.03. Now, what do you call this but for blatant front running? Your comparison of "flash" order to RFQs is not correct. RFQs dont expose orders, but is just a request for quotes. The mechanism is different and you could learn more about this mechanism, should you wish, from CME group. If the buy order for 10000 shares has a limit price of $10.00, BATS won't route the order to NASDAQ since NASDAQ doesn't have an offer at $10.00. Furthermore, it won't flash the order, since the bid price is now lower than the offer price (after filling the first 4000 shares). As a result, there will be a displayed bid for 6000 shares at $10.00 on BATS. Perhaps you should reconstruct the example? I saw my "mistake" after I posted (result of my editing on the run!) and didn't get a chance to follow-up as I had to run. 1. Let us say a mutual fund submits a market buy order for 10,000 shares of XYZ to BATS. Everything else should remain the same in my previous example. 1. There is always a possibility that when the broker routed the order (going back to my example), BATS had 10,000 @ 10.00 (so, the broker did the right thing routing the order to BATS). But when the order was in transit, another order (from somewhere else) took out 6000 of 10,000 @ 10.00 leaving 4,000 @ 10.00. This is a classical distributed system problem, and no broker routing algo can solve this problem. Now, this scenario leaves my previous example of front-running intact, with no fault attributable to broker's routing. 2. When an order is submitted to the market, there is an implied expectation that the market is fair. I do not expect my broker to make sure that the "executing" venue is fair (or device schemes to overcome unfair procedures used at executing venues); I expect executing venues, in-by-themselves, to be fair. The potential for misuse of "flash" orders breaks that expectation. Yes, I agree that the scenario you described does seem unfair to the original investor. You have convinced me that flash orders do present front-running opportunities. I'm working on backtesting pairs trading on US market. Can you give me an idea of how much sould I count in transacton costs. If I calculate my returns based on 100% long+100% short (gross of 200%) taking 10 bps for one way is a resnable figure? I typically assume 5bp one way. Of course, if your brokerage charge higher commissions, you should use a higher figure. Golden Networking (http://goldennetworking.net) is organizing the High-Frequency Trading Experts Workshop 2010 (http://www.HFTExpertsWorkshop.com), Practical Implementation of High-Frequency Trading Strategies, on December 9th and 10th in New York City. It has been recommended for executives in finance and investments who work at Investment Banks, Hedge Funds, Pension Funds, Broker Dealers, Consultancy Groups, Prime Brokers, Solution Providers and Exchanges and wish to gain a thorough understanding and practical knowledge of high-frequency trading.